Today is a huge day here at Sage One HQ. You may have already seen mention of it in the press but if not, let me announce that today we have officially launched our Sage One Add-Ons page! 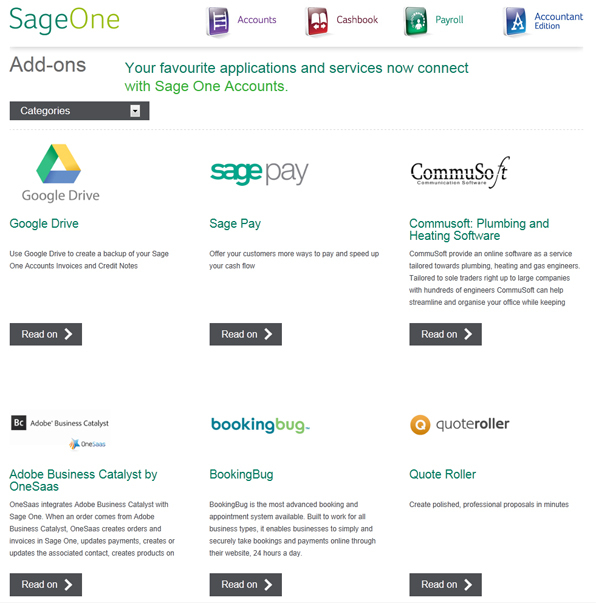 In addition to our existing partnerships with Google, Sage Pay, Microsoft, Barclays, the Institute of Bookkeepers, Royal Mail etc, we launched the Sage One Accounts API at the end of 2012 to allow partners to integrate their services with Sage One. The response so far has been overwhelming with hundreds of registered Sage One developers. We are proud to say that in 6 months we already have over 30 live integrated service offerings at http://uk.sageone.com/add-ons/ (see screenshot below). The launch of the Add-Ons page showcases these services to our customers. It’s more than an Add-Ons page we’re launching here, it’s an entire ecosystem built around Sage One. Now your business can use everything from CRM to Credit Control, from Business Intelligence to eCommerce while some of the services cater for specific industry segments such a tradesmen or hairdressers. All with Sage One at the core. For such a wide variety of businesses, one thing we all have in common is our commitment to utilise the cloud to help the small business owner manage their business more efficiently and effectively. Every company has been an absolute pleasure to work with, the levels of innovation have been staggering and it is an absolute delight to welcome them all as launch partners of the Sage One ecosystem.